Spectra of ZnSe molecule with different type of impurity, model of dopant, geometric structure, ligand and solvent have been investigated combining the results of theory and experiment. Contrast of absorption spectra, Circular Dichroism (CD) spectra and optical rotation shows that absorption spectra and CD spectra can be used to judge the type of molecule, the type of impurity, the geometric structure, the type of ligand and solvent. The spectra can also be used to estimate the model of impurity (dopant or forming alloy) in ZnSe molecule. Besides, optical rotation is influenced by the type of impurity, the model of dopant and the type of ligand. For Zn3Se3, Cd3Se3 and Zn3S3 and Zn4Se4 molecules, they do not have optical rotation. The type of ligand has no influence on the optical rotation. Quantum dots (QDs) have attracted major attention for their uniform quantum size effect. Specifically, the spectra of QDs shift to longer wavelength with increasing of size [1-3]. Conversely, the shapes and the peak positions of spectra can be used to specify QDs in terms of the type and the size [4-6]. Several, II-VI clusters, such as CdTe, ZnSe, CdSe etc. have been investigated [7-9]. The geometric structure and suitable calculated method have been confirmed. Computational research on the influence of solvent and the ligand on the spectra have been conducted . The calculated data are good agreement with the experimental results. In the course of the rapid development of QDs, their chirality has been studied in ever increasing detail. Although the concept of chirality drives from the field organic materials, it is useful to characterize QDs [11,12]. Therefore, it is important to determine the chirality of QDs. Circular Dichroism (CD), which can offer information about primary structure, secondary, and tertiary structures of organic materials is one of the best methods for analyzing chiral states of these materials . CD is used to investigate QDs with respect to chirality [14-16]. Chiral D-Pen and L-Pen capped Cds QDs, which have potential for biomedical user, have been prepared . ZnSe QDs capped with a chiral biomolecule (ligand), 1-glutathione, were studied for their optical activity . A recent study has found that CD spectra are independent of the diameter of QDs . Traditional CD, named electronic CD (ECD), is range from 200 nm to 400 nm (the range of UV), which restricted the application of CD. Vibrational CD (VCD) is CD in the region of infrared spectrum [20-22]. Under the ideal condition, the wavelength of UV is equal to the wavelength of ECD and optical rotatory dispersion. The kind of QDs, the type of impurity, the dopant method, the geometric structure, ligand and solvent have different influence on absorption spectra, ECD, VCD and optical rotation. All these factors have been detailed investigated in the following. For DFT (density functional theory) calculation, we adopted Becke’s three-parameter hybrid exchange functional with the correlation functional by Lee et al. (B3LYP) 6-31G basis set as it was implemented in Gaussian 03 program [23-25]. Figures of geometric structures were generated using GaussView program. Absorption spectra and ECD of these molecules were obtained with time-dependent DFT (TDDFT) [26-30]. Optical rotation and VCD are obtained at the same level with other data. Geometric structures of Cd3Se3, Zn3Se3 and Zn3S3 molecules are hexagon with D3h symmetry. Absorption spectra, ECD and VCD spectra of Cd3Se3, Zn3Se3 and Zn3S3 molecules are depicted in Figure 1. The peaks wavelengths of absorption spectra of Cd3Se3, Zn3Se3 and Zn3S3 molecules are located in 285 nm, 261 nm, and 257 nm. For the same size of Cd3Se3, Zn3Se3 and Zn3S3 molecules, the wavelengths of peaks of absorption spectra shift to blue in the order of Cd3Se3, Zn3Se3 and Zn3S3 (Figure 1a). Namely, the order of peaks wavelengths is Cd3Se3>Zn3Se3 >Zn3S3. ECD and VCD also has the order with absorption spectra (Figure 1b and 1c). The order of ECD is Cd3Se3>Zn3Se3 >Zn3S3, which is the same order with absorption spectra. Frequency of VCD have opposite rule with absorption spectra and ECD. As we have known, absorption spectra of nanoparticle are influenced by the type and the size of materials for nanomaterials. From the data of ECD and VCD, we have confirmed that the type materials would influence ECD and VCD spectra. Therefore, ECD and VCD can be as data to judge the size and type of nanoparticle. Besides, the shift of ECD have the same quantity with absorption spectra, seen from Figure 1d. 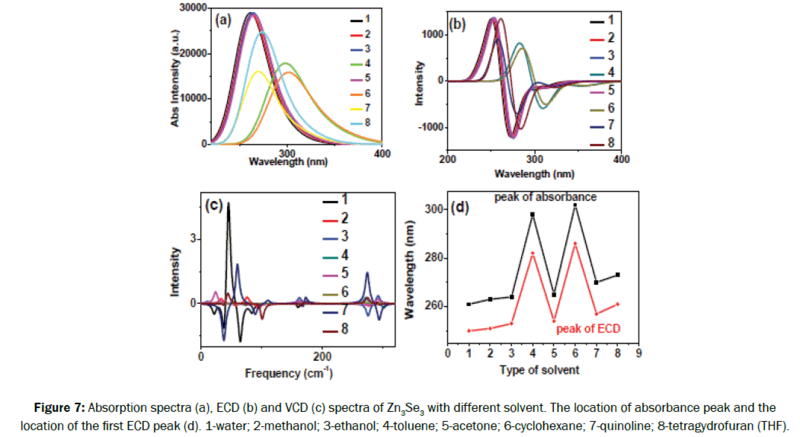 Figure 1: Absorption spectra (a), ECD (b) and VCD (c) spectra of Zn3Se3, Cd3Se3 and Zn3S3 molecules, the location of absorbance peak and the location of the first ECD peak (d). Moreover, we have calculated the optical rotation of Cd3Se3, Zn3Se3 and Zn3S3 molecules. The results show that three molecules have no optical rotation. It is clear that optical rotation of nanoparticle does not relate to the type of materials. Therefore, for hexagon structure with D3h symmetry, they have no optical rotation. From this view, substitution doping Zn3Se3 molecules such as Zn2AgSe3, ZnAg2Se3, they would do not have optical rotation. Geometric structures of Ag-Zn3Se3 , Cd-Zn3Se3 , Cu-Zn3Se3 , Mn-Zn3Se3 molecules are showed in Figure 2. The impurities are put in the center of hexagon before optimization. The whole molecule is planar (Figure 2) , Ag-Zn 3Se3 have different geometric structure with Cd-Zn3Se3 , Cu-Zn3Se3 and Mn-Zn3Se3 molecules. Ag atom is not in the center of hexagon after optimizing. Cd, Cu and Mn atoms are in the center of hexagon, but they are not in a plane with Zn3Se3 molecule. Figure 2: Geometric structures of Ag-Zn3Se3, Cd-Zn3Se3, Cu-Zn3Se3 and Mn-Zn3Se3 molecules. Absorption spectra, ECD and VCD spectra of Ag-Zn3Se3 , Cd-Zn3Se3 , Cu-Zn3Se3 , Mn-Zn3Se3 molecules are depicted in Figure 3a-3c. Clearly, the spectra show Ag-Zn3Se3 , Cd-Zn3Se3 and Cu-Zn3Se3 molecules have two peaks. Mn-Zn3Se3 molecule only has one peak. From experiment, we have known that Ag and Cu doped ZnSe quantum dots (QDs) had the photoluminescence (PL) of ZnSe QDs and impurities of Ag or Cu [31,32]. Mn doped ZnSe QDs has one peak which is PL of Mn impurity . The reason is that conduction band or valence band of Ag and Cu is among the band gap of ZnSe and both conduction band and valence band of Mn is among the band gap of ZnSe. Therefore, Cd doped ZnSe QDs have the same band structure with Ag and Cu doped ZnSe QDs. Figure 3: Absorption spectra (a), ECD (b) and VCD (c) spectra of Ag-Zn3Se3, Cd-Zn3Se3, Cu-Zn3Se3, Mn-Zn3Se3 molecules. ECD spectra of Ag-Zn3Se3 and Cu-Zn3Se3 are similar. Cd-Zn3Se3 molecule has strong ECD spectra. ECD spectra of Mn-Zn3Se3 is close to zero. Moreover, ECD spectra of Ag-Zn3Se3 , Cd-Zn3Se3 , Cu-Zn3Se3 , Mn-Zn3Se3 molecules are different from Zn3Se3 molecule. Thus, ECD spectra are related to type of impurities. VCD spectra of Ag-Zn3Se3 , Cd-Zn3Se3 , Cu-Zn3Se3 , Mn-Zn3Se3 molecules are different. Ag and Mn doped ZnSe molecules have stronger VCD spectra than those of Cd and Cu doped ZnSe molecules. VCD spectra of Ag-Zn3Se3 molecule is similar to that of Zn3Se3 molecule. Obviously, the influence of structure and impurity type is little on VCD spectra. The calculated optical rotation data for Ag-Zn3Se3 , Cd-Zn3Se3 , Cu-Zn3Se3 , and Mn-Zn3Se3 molecules are -28, 12, 1 and 39, respectively. As we have known that Zn3Se3 molecule have no optical rotation. The impurity in Zn3Se3 molecule has obvious influence on the optical rotation. Geometric structures of Ag-Zn3Se3 , Zn2AgSe3, ZnAg2Se3 and Zn3Se3 molecules are showed in Figure 4a. Absorption spectra, ECD and VCD spectra are depicted in Figure 4b-4d. Vacancy doping Ag-Zn3Se3 has different structure from Zn3Se3 molecule. Substitution doping Zn2AgSe3, ZnAg2Se3, and Zn3Se3 molecules have the similar geometric structures. Therefore, impurity in substitution doping has little influence on the geometric structure of Zn3Se3 molecule. Absorbance spectra show that vacancy doping Ag-Zn3Se3 has two peaks. Substitution doping Zn2AgSe3 and ZnAg2Se3 molecule have only one peak which is similar to that of Zn3Se3 molecule. Therefore, substitution doping structure is inclined to forming alloy materials. Vacancy doping molecule may introduce an impurity band between band gaps of host material. ECD and VCD spectra of Ag-Zn3Se3 , Zn2AgSe3, ZnAg2Se3 are close to zero, compared to Zn3Se3 molecule. The dopant of impurity of Ag would change the characters of ECD and VCD. The optical rotation data of Ag-Zn3Se3 , Zn2AgSe3, ZnAg2Se3 and Zn3Se3 molecules are -28, 1, -1 and 0. Ag-Zn3Se3 molecule has strong optical rotation. Zn2AgSe3, ZnAg2Se3 and Zn3Se3 molecules do not have optical rotation. Thus, optical rotation is influenced by geometric structure but not impurity. 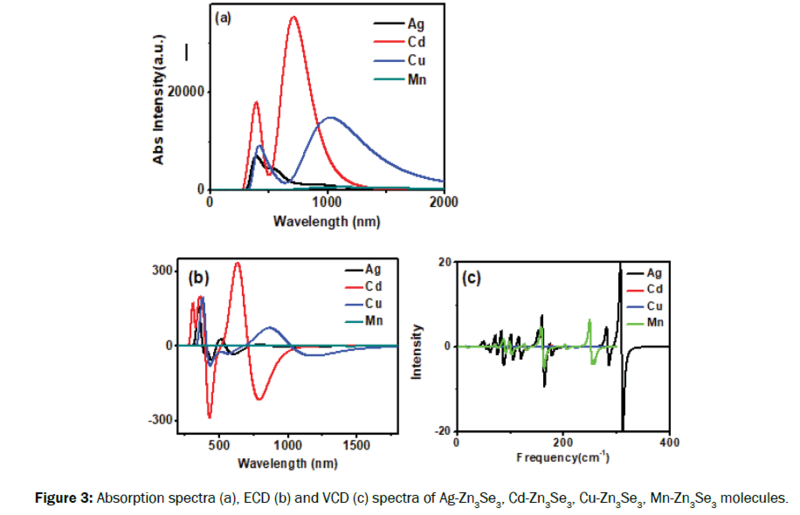 Figure 4: Geometric structures (a), Absorption spectra (b), ECD (c) VCD and (d) spectra of Ag-Zn3Se3, Zn2AgSe3, ZnAg2Se3 and Zn3Se3. II-VI QDs have two kinds of structures zinc blende and Wurtzite. Zn3Se3 is similar to Wurtzite. Zn4Se4 molecule is close to zinc blende. Geometric structures of Zn3Se3 and Zn4Se4 molecules are inserted in absorption spectra of Figure 5a and ECD spectra of Figure 5b. Absorption spectra show that the peak of Zn4Se4 molecule shift to longer wavelength than that of Zn3Se3 molecule. This agree with quantum size effect. Namely, with increasing of size, the absorption spectra of QDs would shift to long wavelength. ECD spectra of Zn3Se3 and Zn4Se4 molecules have the same shape, which illustrate geometric structure of molecule would not change the shape of ECD spectra. VCD spectra of Zn4Se4 molecule are zero. Namely, Zn4Se4 molecule has weak VCD. To make clear, we have calculated the VCD spectra of Cd4Se4 molecule. The result shows that Cd4Se4 molecule has no VCD spectra. Therefore, the type of QDs has little influence on the VCD spectra. Optical rotation of Zn3Se3 and Zn4Se4 molecules are zero. Thus, two geometric structures of Zn3Se3 and Zn4Se4 molecules both have good symmetry that results in weak optical rotation. Figure 5: Absorption spectra (a) and ECD spectra (b) of Zn3Se3 and Zn4Se4molecules. Geometric structures of Zn3Se3 and Zn4Se4molecules are inserted in (a) and (b). Ligand has little influence on the geometric structure of Zn3Se3 molecule. However, ligand would influence absorption spectra (Figure 6a) , ECD (Figure 6b), VCD (Figure 6c) and optical rotation. Compared to that of structure without ligand, absorption spectra of Zn3Se3 molecule with ligand shift to longer wavelength. Moreover, the data of shift are different for different type ligand. ECD have the same rule with absorption spectra. For absorption spectra and ECD, Zn3Se3 molecule with ligand cysteine and penicillium amine have similar shape. Moreover, the intensity and the wavelength are similar. VCD spectra of Zn3Se3 molecule with ligand cysteine and penicillium amine are different. Obviously, the influence of ligand on Zn3Se3 molecule with different ligand is not the same. Data of optical rotation for Zn3Se3 molecule without ligand, MPA, cysteine and penicillium amine are 0, -13, -356 and -353. Clearly, optical rotation of Zn3Se3 molecule is related to the type of ligand. Therefore, optical rotation of QDs would be controlled through changing the type of ligand. Figure 6: Absorption spectra (a), ECD (b) and VCD (c) spectra of Zn3Se3 without ligand and with different ligands MPA (HS-CH2-CH2-COOH), cysteine (HS-CH2-CH(NH2)-COOH), and penicillium amine (CH3-C(CH3)(SH)-CH(NH2)-COOH). Absorption spectra, ECD and VCD are depicted in Figure 7. Obviously, solvent have influence on absorbance spectra, ECD and VCD. Moreover, the shift rule of absorbance spectra is according to the change rule of ECD spectra (Figure 7d). Optical rotation of Zn3Se3 molecule with different solvent are zero. Namely, optical rotation is not related to the type of solvent. Figure 7: Absorption spectra (a), ECD (b) and VCD (c) spectra of Zn3Se3 with different solvent. The location of absorbance peak and the location of the first ECD peak (d). 1-water; 2-methanol; 3-ethanol; 4-toluene; 5-acetone; 6-cyclohexane; 7-quinoline; 8-tetragydrofuran (THF). The manuscript has investigated the influence of the type of impurity, model of dopant, geometric structure, ligand and solvent of ZnSe molecule on absorption spectra, CD spectra and optical rotation. The results show that CD spectra can be used to estimate the characters of molecules as absorption spectra. Therefore, CD spectra as a practical method are proposed for experimental investigation of ZnSe QDs. Optical rotation is an important nature of application of QDs. Calculated data illustrate that optical rotations of molecules are influenced by the type of impurity, the model of dopant and the type of ligand. For Zn3Se3 , Cd3Se3 and Zn3S3 and Zn4Se4 molecules, they do not have optical rotation. The type of ligand has no influence on the optical rotation. This work is supported by National Key Basic Research Program of China (Grant No. 2015CB352002), Natural Science Foundation of China (Grant Nos. 61475034, 61875037, 21875034), the Foundation of Jiangsu Province for Outstanding Young Teachers in University (Grant No. BK20180064), the Fundamental Research Funds for the Central Universities. Jiang P and Chen Z. Ligand effect on the synthesis of emission-tunable near-infrared Ag2S quantum dots. New J Chem. 2017;41:5707-5712. Wu Z, et al. Carbon dots: materials, synthesis, properties and approaches to long-wavelength and multicolor emission. Mater Chem B. 2017;5:3794-3809. Andres-Penares D, et al. Quantum size confinement in gallium selenide nanosheets: band gap tunability versus stability limitation. J Nanotech. 2017;28:175701. Butkus J, et al. The Evolution of Quantum Confinement in CsPbBr3 Perovskite Nanocrystals. J Chem Mater. 2017;29:3644-3652. Zhang F, et al. Colloidal Synthesis of Air-Stable CH3NH3PbI3 Quantum Dots by Gaining Chemical Insight into the Solvent Effects. Chem Mater. 2017;29:3793-3799. Kirakosyan A, et al. Optical Properties of Colloidal CH3NH3PbBr3 Nanocrystals by Controlled Growth of Lateral Dimension. J Cryst Growth Des. 2017;17:794-799. Xu S, et al. Theoretical simulation of CdTe nanocrystals in aqueous synthesis. Struct Chem. 2010;21:519-525. Xu S, et al. Molecular Structure. 2009;916:168-171. Xu S, et al. Theoretical investigation of CdSe clusters: influence of solvent and ligand on nanocrystals. J Molecular Modeling. 2010;16:469-473. Xu S, et al. Influence of solvent on aqueous CdTe nanocrystals: Theoretical and experimental investigation. J Mol Struct. 2012;1010:26-31. Berova N, Circular Dichroism: Principles and Applications, (2ndedn), Wiley-VCH; New York, 2000. Fasman GD, Circular dichroism and the conformational analysis of biomolecules. New York. 1996. Ben-Moshe, et al. Chirality and chiroptical effects in inorganic nanocrystal systems with plasmon and exciton resonances. Chem. Soc Rev. 2013;42:7028. Fan Z and Govorov AO. Plasmonic Circular Dichroism of Chiral Metal Nanoparticle Assemblies. Nano Lett. 2012;12:3283-3289. Elliott SD, et al. Chiral shells and achiral cores in CdS quantum dots. Nano Lett. 2008;8:2452-2457. Melnikan D, et al. Chiroptical activity in colloidal quantum dots coated with achiral ligands. Optics Express. 2016;24:251704. Moloney MP, et al. Chiral highly luminescent CdS quantum dots 2007;38: 3900-3902. Moshe AB and Markovich G. Chiral Ligand Induced Circular Dichroism in Excitonic Absorption of Colloidal Quantum Dots. J Chem. 2012;52:1104-1110. Choi JK, et al. Chirality Inversion of CdSe and CdS Quantum Dots without Changing the Stereochemistry of the Capping Ligand. Acs Nano. 2016;10:3809-3815. Holzwarth G. Infrared circular dichroism of carbon-hydrogen and carbon-deuterium stretching modes. Observations. J Am Chem Soc. 1974;96:251. Nafie LA, Vibrational circular dichroism of 2,2,2-trifluoro-1-phenylethanol. J Am Chem Soc. 1975;97:3842. Nafie LA, et al. Vibrational optical activity. Appl Spectrosc. 1996;28:14. Frisch, M.J. et al. GAUSSIAN 03, Revision D.01; Gaussian, Inc., Wallingford, CT, 2004. Lee C, et al. Development of the Colle-Salvetti correlation-energy formula into a functional of the electron density. Phys Rev B. 1988;37:785. Miehlich B, et al. Results Obtained With The Correlation Energy Density Functionals Of Becke And Lee, Yang And Parr. Chem Phys Lett. 1989;157:200. Helgaker T and Jorgensen P. An electronic Hamiltonian for origin independent calculations of magnetic properties. J Chem Phys. 1991;95:2595. Bak KL, et al. Gauge origin independent multiconfigurational self-consistent field theory for vibrational circular dichroism. J Chem Phys. 1993;98:8873. Bak KL, et al. Calculation of electronic circular dichroism fortrans-cyclooctene using London atomic orbitals. Theor Chim Acta. 1995;90:441. Olsen J, et al. Orbital connections for perturbation-dependent basis sets. Theor. Chim Acta 1995;90:421. Autschbach J, et al. Chiroptical properties from time-dependent density functional theory Circular dichroism spectra of organic molecules. J Chem Phys. 2002;116:6930. Xu S, et al. Aqueous synthesis of internally doped Cu:ZnSe/ZnS core-shell nanocrystals with good stability. Nanotechnol. 2011;22:275605. Xu S, et al. Materials Research Express. 2014;1:015202. Rajesh C, Generation of white light from co-doped (Cu and Mn) ZnSe QDs. J Exper Nanoscience. 2015;10:1082-1092.